Hi, I'm down here in zone 9. I planted several seeds in a 3gal. 20 months later- blooms.!! I have velvet beans also. 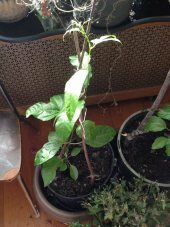 Scarlet runner bean, and any pole beans. Hi again. New gardening activities for the 2014 year! egyptian spinach, a dwarf chinese amaranth, and others. I need milk thistle also. Wow-talking about seeds- that is amazing. I'm northern Pinellas county. west central Florida.